A contractor, Mr. Mustapha Yerima, Monday, narrated before the Federal High Court in Abuja, how the former Chief of Defence Staff, Air Chief Marshal Alex Badeh, paid his firm, Rytebuilders Technologies Limited, N1.2billion to construct a multipurpose shopping mall for him in Abuja. Badeh is facing trial over allegation that he diverted over N3.9bn from accounts of the Nigerian Air Force, NAF, within 2013. He is answering to a 10-count criminal charge the Economic and Financial Crimes Commission, EFCC, preferred against him. At the resumed hearing Monday, Yerima, who testified as the fourth prosecution witness, PW-4, told the court that Badeh paid N650million to acquire the land where the mall was constructed. He said that the land situate at plot 1386, Oda Crescent, Cadastral Zone, A07, close to Aminu Kano Crescent in Wuse II, Abuja, was originally registered in the name of one Ayodele Fayose. Though Yarima, who is the Managing Director of Rytebuilders Technologies Limited, did not clarify if the Fayose he made reference to is the current Governor of Ekiti State, he however told the court that at the point negotiation was to commence on land, it was discovered that the ownership had been transferred to one Mr. Tony who he said was the owner of Hytechs Furniture. 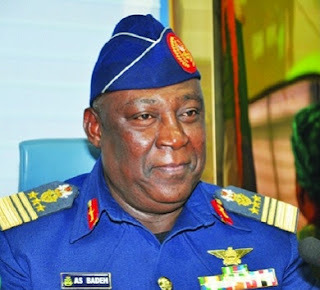 The witness told the court that it was a former Director of Finance and Account at the NAF, Air Commodore Abdullahi Yushau, retd, who had earlier testified as the PW-1 in the matter, that helped Badeh to facilitate the purchase of the land. Narrating how the land was eventually bought, the witness said upon realizing that Fayose had transferred ownership to ‘Mr. Tony’ whose surname he could not remember, he said they immediately sought for his contact. He said they eventually got Mr. Tony, who also revealed that the land had been sold to a third party, one Casagro Investment Limited. “We got back to Yushua to inform him. Because there were other agents involved, we got to find out where Casagro Investment is based. Yushua then directed us to go and negotiate with Casagro Investment Ltd. When we got to the firm, it named the price as N650m. “After then we got back to Yushua and told him the price and he said he would get back to us. He later called us and gave us N650m in dollar equivalent because Casagro insisted on cash payment. “We took the money to his office; he confirmed and gave us all the original documents of the land. Again we called Yushau and asked him on whose name should the documents be registered, namely the Deed of Assignment and the Power of Attorney. “Yushua told me that we should prepare the documents in our company’s name, which he said we would later transfer to another company after we might have discussed with his boss in person of Air Marshal Badeh. “We did exactly as he said because at that time our interest was to construct the mall. We handed over the original documents to Yushua. “After that, he called us one day again that they are ready to start construction of the mall. He gave us a sketch of the building and said we should provide him with provisional estimate of what the construction of the mall would cost. “We gave him the estimate of N1.3billion. Then Yushua complained and said he would get to his boss, Air Marshal Badeh and that whatever he decides he would get back to us. “He called me after two seeks to give me architectural drawing and compete bill of contract. That was when he gave me a bill of N1.2bn. “I remember at one stage we calculated about N480m as mobilization. He then gave us about N340m in dollar equivalent. “Then we stated constructing the mall, at each stage we provided him with site progress pictures which he said he would be submitting to his boss, Air Marshal Badeh, so that he would appreciate the progress of the work. “We were paid a total of N860m or N880m from the NAF account. As soon as we were about to exhaust the payment made to us at that time, we realized there were a couple of things that were not part of the bill of payment we earlier submitted. “We quickly raised an alert and also submitted a review because some items, their prices had gone up or as a result of exchange rate on some of the items we imported. Then the job began to slow down. By then we had come to the finishing stage.